Click here for a pdf of the map. In the Pacific Ocean approximately 130 nautical miles east-southeast of Pago Pago Harbor, American Samoa, lies Rose Atoll -- the easternmost Samoan island and the southernmost point of the United States. This small atoll, which includes the Rose Atoll National Wildlife Refuge with about 20 acres of land and 1,600 acres of lagoon, remains one of the most pristine atolls in the world. The lands, submerged lands, waters, and marine environment around Rose Atoll support a dynamic reef ecosystem that is home to a very diverse assemblage of terrestrial and marine species, many of which are threatened or endangered. One of the most striking features of Rose Atoll is the pink hue of fringing reef caused by the dominance of coralline algae, which is the primary reef-building species. Though there are roughly 100 species of stony corals, the shallow reefs are dominated by crustose coralline algae, making them distinctive and quite different from those found at other Samoan islands. The marine area provides isolated, unmolested nesting grounds for green and hawksbill turtles and has the largest number of nesting turtles in American Samoa. Its waters are frequented by numerous large predators: whitetip reef sharks, blacktip reef sharks, gray reef sharks, snappers, jacks, groupers, and barracudas. Species that have faced depletion elsewhere, some of which have declined worldwide by as much as 98 percent, are found in abundance at Rose Atoll, including giant clams, Maori wrasse, large parrotfishes, and blacktip, whitetip, and gray reef sharks. Humpback whales, pilot whales, and the porpoise genus Stenella have all been spotted at Rose Atoll. There are 272 species of reef fish, with seven species first described by scientists at Rose and dozens more new species discovered on the first deep water dive to 200 meters. Recent submersible dives around Rose Atoll have revealed abundant marine life, deep sea coral forests, and several new fish and invertebrate species. Rose Atoll supports most of the seabird population of American Samoa, including 12 federally protected migratory seabirds, five species of federally protected shorebirds, and a migrant forest bird, the long-tailed cuckoo. Rare species of nesting petrels, shearwaters, and terns are thriving at Rose Atoll and increasing in number. The atoll is known to Samoans, who have periodically visited over the past millennium, as "Nu'u O Manu" ("Village of seabirds"). It is believed that Polynesians have harvested at Rose Atoll for millennia and several species, such as the giant clam, were used for cultural celebrations and events. Few relatively undisturbed islands remain in the world and Rose Atoll is one of the last remaining refuges for the seabird and turtle species of the Central Pacific. Threatened Pisonia atoll forest trees are also found at Rose Atoll. NOW, THEREFORE, I, GEORGE W. BUSH, President of the United States of America, by the authority vested in me by section 2 of the Antiquities Act, do proclaim that there are hereby set apart and reserved as the Rose Atoll Marine National Monument (the "monument" or "marine national monument") for the purpose of protecting the objects described in the above preceding paragraphs, all lands and interests in lands owned or controlled by the Government of the United States within the boundaries that lie approximately 50 nautical miles from the mean low water line of Rose Atoll as depicted on the accompanying map entitled "Rose Atoll Marine National Monument" attached to and forming a part of this proclamation. The Federal land and interests in land reserved consists of approximately 13,451 square miles of emergent and submerged lands and waters of and around Rose Atoll in American Samoa, which is the smallest area compatible with the proper care and management of the objects to be protected. All Federal lands and interests in lands within the boundaries of this monument are hereby withdrawn from all forms of entry, location, selection, sale, or leasing or other disposition under the public land laws to the extent that those laws apply. 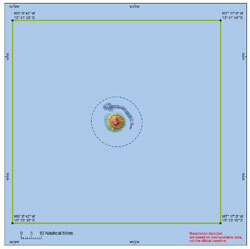 The Secretary of the Interior shall have management responsibility for the monument, including Rose Atoll National Wildlife Refuge, in consultation with the Secretary of Commerce, except that the Secretary of Commerce, through the National Oceanic and Atmospheric Administration, shall have the primary management responsibility regarding the management of the marine areas of the monument seaward of mean low water, with respect to fishery-related activities regulated pursuant to the Magnuson- Stevens Fishery Conservation and Management Act (16 U.S.C. 1801 et seq. ), and any other applicable authorities. The Secretary of Commerce shall initiate the process to add the marine areas of the monument to the Fagatele Bay National Marine Sanctuary in accordance with the National Marine Sanctuaries Act (16 U.S.C. 1431 et seq. ), including its provision for consultation with an advisory council, to further the protection of the objects identified in this proclamation. In developing and implementing any management plans and any management rules and regulations, the Secretary of Commerce shall consult with the Secretary of the Interior and shall designate and involve as cooperating agencies the agencies with jurisdiction or special expertise, including the Department of State, the Department of Defense, and other agencies through scoping in accordance with the National Environmental Policy Act (42 U.S.C. 4321 et seq. ), its implementing regulations and with Executive Order 13352 of August 26, 2004, Facilitation of Cooperative Conservation, and shall treat as a cooperating agency the Government of American Samoa, consistent with these authorities. The Secretary of the Interior shall continue to manage the Rose Atoll National Wildlife Refuge consistent with the protection of the objects identified in this proclamation. The Secretary of the Interior shall, in developing any management plans and any management rules and regulations governing the Rose Atoll National Wildlife Refuge, comply with the National Environmental Policy Act and consult with the Secretary of Commerce. For the purposes of protecting the objects identified above, the Secretaries of the Interior and Commerce, respectively, shall not allow or permit any appropriation, injury, destruction, or removal of any feature of this monument except as provided for by this proclamation or as otherwise provided for by law. Subject to such terms and conditions as the Secretaries deem necessary for the care and management of the objects of this monument, the Secretary of the Interior may permit scientific exploration and research within the monument, including incidental appropriation, injury, destruction, or removal of features of this monument for scientific study, and the Secretary of Commerce may permit fishing within the monument for scientific exploration and research purposes to the extent authorized by the Magnuson-Stevens Fishery Conservation and Management Act. The prohibitions required by this proclamation shall not restrict scientific exploration or research activities by or for the Secretaries, and nothing in this proclamation shall be construed to require a permit or other authorization from the other Secretary for their respective scientific activities. The Secretaries shall prohibit commercial fishing within the monument. Subject to such terms and conditions as the Secretaries deem necessary for the care and management of the objects of this monument, the Secretaries may permit noncommercial and sustenance fishing or, after consultation with the Government of American Samoa, traditional indigenous fishing within the monument. The Secretaries of the Interior and Commerce, respectively, in consultation with the Government of American Samoa, shall provide for a process to ensure that recreational fishing shall be managed as a sustainable activity consistent with Executive Order 12962 of June 7, 1995, as amended, and other applicable law. This proclamation shall be applied in accordance with international law. No restrictions shall apply to or be enforced against a person who is not a citizen, national, or resident alien of the United States (including foreign flag vessels) unless in accordance with international law. The management plan and implementing regulations shall impose no restrictions on innocent passage in the territorial sea or otherwise restrict navigation and overflight and other internationally recognized lawful uses of the sea in the monument and shall incorporate the provisions of this proclamation regarding Armed Forces actions and compliance with international law. Nothing in this proclamation shall be deemed to diminish or enlarge the jurisdiction of the Government of American Samoa. The Secretaries of the Interior and Commerce shall, in developing any management plans and any management rules and regulations governing the marine areas of the monument, as described above, consult with the Government of American Samoa. 1. The prohibitions required by this proclamation shall not apply to activities necessary to respond to emergencies threatening life, property, or the environment, or to activities necessary for national security or law enforcement purposes. 2. Nothing in this proclamation shall limit agency actions to respond to emergencies posing an unacceptable threat to human health or safety or to the marine environment and admitting of no other feasible solution. 1. The prohibitions required by this proclamation shall not apply to activities and exercises of the Armed Forces (including those carried out by the United States Coast Guard). 2. The Armed Forces shall ensure, by the adoption of appropriate measures not impairing operations or operational capabilities, that its vessels and aircraft act in a manner consistent, so far as is reasonable and practicable, with this proclamation. 3. In the event of threatened or actual destruction of, loss of, or injury to a monument living marine resource resulting from an incident, including but not limited to spills and groundings, caused by a component of the Department of Defense or the United States Coast Guard, the cognizant component shall promptly coordinate with the Secretary of the Interior or Commerce, as appropriate for the purpose of taking appropriate actions to respond to and mitigate any actual harm and, if possible, restore or replace the monument resource or quality. 4. Nothing in this proclamation or any regulation implementing it shall limit or otherwise affect the Armed Forces' discretion to use, maintain, improve, manage, or control any property under the administrative control of a Military Department or otherwise limit the availability of such property for military mission purposes. This proclamation is not intended to, and does not, create any right or benefit, substantive or procedural, enforceable at law or in equity, by any party against the United States, its agencies, instrumentalities, or entities, its officers, employees, or agents, or any other person. Nothing in this proclamation shall be deemed to revoke any existing withdrawal, reservation, or appropriation; however, the national monument shall be dominant over any other existing Federal withdrawal, reservation, or appropriation. Warning is hereby given to all unauthorized persons not to appropriate, excavate, injure, destroy, or remove any feature of this monument and not to locate or settle upon any lands thereof. IN WITNESS WHEREOF, I have hereunto set my hand this sixth day of January, in the year of our Lord two thousand nine, and of the Independence of the United States of America the two hundred and thirty-third.